THEY COLONISED EARTH… NOW THEY'RE ALL LARGER THAN GRIZZLY BEARS! 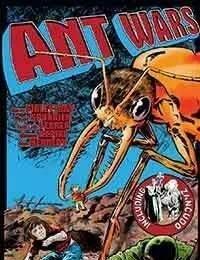 ONLY MILLIMETERS IN LENGTH, THEY COLONISED EARTH… NOW THEY'RE ALL LARGER THAN GRIZZLY BEARS!<br />ANT WARS.<br />When military personnel spray an untested insecticide on ants in the Brazilian rainforest, the colony mutate into super-intelligent creatures with a taste for human flesh! As the terrifying army head closer towards civilisation, Captain Villa and a young forest native race ahead in the vain attempt to warn an unprepared world!<br />Written by Gerry Finley-Day (Rogue Trooper), with Art by José Luis Ferrer (Robo-Hunter), Lozano (M.A.C.H.1), Pena (Planet of the Damned) and Azpiri (Black Hawk), Ant Wars is an exhilarating take on the classic sci-fi movies of the fifties and sixties.